If you are an aspiring professional speaker making the move from free to fee or are established in your speaking profession wanting to move up to the $7500, $10,000, $20,000 per keynote range, you must show meeting and event planners that you know the professional speaking game. There are many opportunities during the speaker hiring process to display your knowledge of the speaking biz, but no first impression is more important than your website. It is in that speaker/author website that you should invest all you can afford…and maybe even a little more! I’ve made a living from my own websites for 18 years and have built a business helping more than 300 others with their Internet projects. My #1 mistake at the beginning was not only a lack of planning, but it was down right being against planning. Period! My website development turnaround time was reduced by 73% (based on number of days). Incredible! Save money because your designer will be able to quote your project accurately–the first time around. It’s simple. The Essential Website Pre-Flight is an MS Word document that you download to your computer after your order is placed. Step-by-step, you are to answer the questions related to your company, target market, products and design desires. 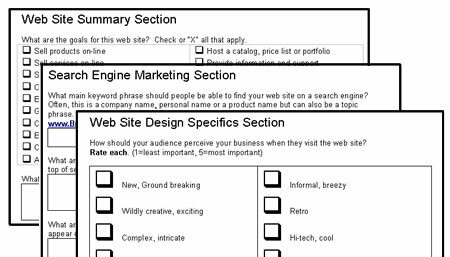 With these questions answered, you can easily hand them to any web designer to show them exactly what you’re looking for in a website. Of course, that’s a very very basic display of the process. Our pre-flight will guide you step-by-step through getting those questions answered. Here’s a visual sample of what you’ll get.